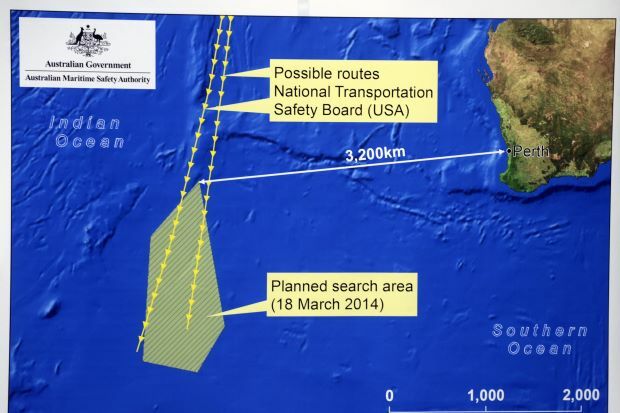 KUALA LUMPUR — Investigators probing the disappearance of MAS MH370 believe the plane most likely flew into the southern Indian Ocean, a source close to the investigation said on Wednesday. An unprecedented search for the Boeing 777-200ER is under way involving 26 nations in two vast search "corridors", one arcing north overland from Laos towards the Caspian Sea, the other curving south across the Indian Ocean from west of Indonesia to west of Australia. The view is based on the lack of any evidence from countries along the northern corridor that the plane crossed their airspace, and the failure to find any trace of wreckage in searches in the upper part of the southern corridor. China said on Wednesday it had not yet found any sign of the aircraft crossing into its territory. MAS flight MH370 vanished from civilian air traffic control screens off Malaysia's east coast at 1.21am. local time on March 8, less than an hour after taking off from Kuala Lumpur for Beijing. Investigators piecing together patchy data from military radar and satellites believe that someone turned off vital datalinks and turned west, re-crossing Peninsula Malaysia and following a commercial route towards India. After that, ephemeral pings picked up by one commercial satellite suggest the aircraft flew on for at least six hours, but it is not known for sure if it went north or south. The data from the satellite placed the plane somewhere in one of the two corridors when the final signal was sent at 8.11am.